If you're thinking of a holiday or birthday gift for a DeafBlind kid who has curious hands... or any other kid no matter what their abilities are- check out Squidz! Orion wasn't interested in it at first but as time went by he learned that they have suckers. He'd pull them off the sides of the bathtub and eventually pull them off himself when I put them on him. And the best part- which happens spontaneously and only when I don't have my camera- he would put it on himself, thwock it off, then back on again and again! Here's an image of Shrek-Orion, courtesy of his mama before he thwocked them off. Also if you look closely in this photo you'll see Orion's hands are open flat, palms up. He was feeling and keeping his hands exactly at the surface- 50% in water, 50% in air. And then his mom had to go and give him Shrek antennae. 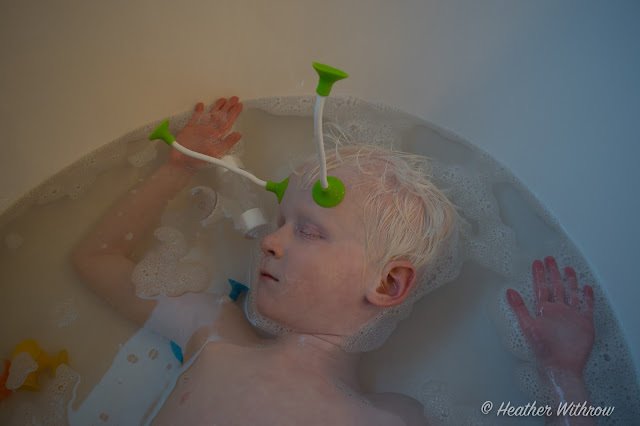 A 6 year old white-haired DeafBlind boy relaxes in the tub but also has two long 'antennae' with green suckers stuck on his forehead.